Coming in at #2 in our 2018 music video countdown is the debut vid from high-energy gypsy brass band Black Masala, the title track from their glorious new album Trains and Moonlight Destinies. Come to Black Masala’s Holiday Party Friday night at The Wharf’s Union Stage, and you’ll also see Philly’s Swift Technique and our own Shamans of Sound and then you will go home very happy. Pro tip: buy tix right now! Frankly, we’re a bit surprised that gypsy-influenced brass band Black Masala hadn’t made a proper music video until now. The title track of their brand new full length release Trains and Moonlight Destinies is a perfect place to start. We’ve been fans of this high-energy group for many years now, easily recommending them for fans of Gogol Bordello and Rebirth Brass Band. This vid by Eyelum does a fantastic job of capturing both the mystery and surreality of their lyrics and the punk power of their live show. Co-signers Mike Ounallah and Kristen Long each take parallel Lynch-ian journeys, with camera jump cuts mirroring the song’s brass cadence. Bravo! You’ve got two more chances to catch Black Masala live in 2018: Friday November 30th at Villain & Saint in Bethesda, and another Friday December 21st at The Wharf’s Union Stage. Tony discovers the origin of his hometown’s name, while Paul plays the songs in alphabetical order. We at Hometown Sounds are pretty old hat in the DC music podcasting game, but we get pretty excited to see new shows join in the scene. Audio Barre is a new podcast highlighting some cool acts in our area, and their latest episode goes in depth with one of our long time faves, funky brass band Black Masala. In addition to interviews, the producers at Centreville VA studio Blue Hippo Recordings shoot live performance audio and video, and this clip of Black Masala performing “Oh No” from last year’s full length album I Love You Madly shows how unique and funktacular this band is. Too bad you can’t experience this live music party any time soon. Oh wait! Look at that, they’re headlining a big show tonight at Iota in Clarendon with Brooklyn’s Slavic Soul Party and Big Mama Shakes from Richmond. If you love tuba as much as we do, we’ll high five you there. This week Tony’s worn down from going to too many shows and Paul DJed next to a spinning boulder. In addition to recapping their Halloween outings, they serve up the great new songs from DC that you demand! There are a lot of great DC music shows to see tonight, including Paint Branch at Comet Ping Pong, Justin Trawick at Iota, Young Summer at Jammin’ Java, Heavy Breathing at Black Cat and Margot MacDonald at Lubber Run Amphitheater in Arlington. I love you if you see any of them. 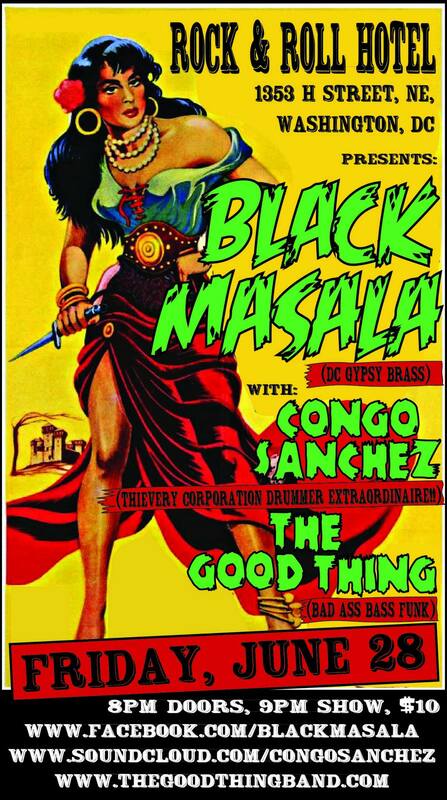 But if you’re unsure what to check out, my pick of the night is the amazing lineup of Black Masala, Congo Sanchez and The Good Thing at H Street NE’s Rock & Roll Hotel. The Good Thing are a dedicated and dynamic new funk band that will get the party rolling instantly. Here’s a free download from their recent EP Get Funky. I admit, I am a sucker for New Orleans brass bands like Rebirth, Stooges and The Hot 8. We may not have any bands in DC that fit that particular mold (yet! ), but Black Masala scratches that itch for me nicely. They bring a gypsy influence to their high energy shows, and I could not be more excited to check this out tonight. And finally, our video feature of the day comes from Congo Sanchez. Best known as the drummer for Thievery Corporation, he turns electronic music performance around by featuring live drums instead of preprogrammed drum machines. Flex Mathews, the most versatile rapper in DC, adds a crucial element to the live show. In this video Congo Sanchez reminisces of the first year of his new band’s forming, performing and touring, and what the future holds.